. . . 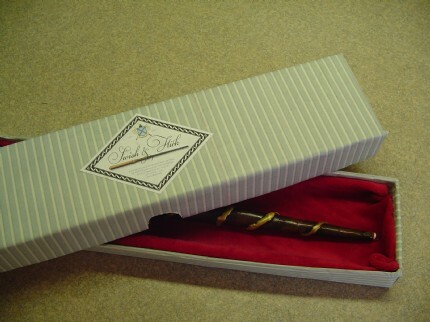 In order for it to perform its duties, the wand box must be made to exacting dimensions, because nothing but the best boxes are capable of both containing and maintaining a wand's magic in it's most potent state.
. . . 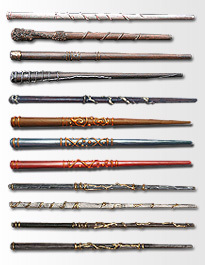 Since ancient times the wandbox maker's craft has been a tradition passed down through the great wandbox making families and of course has given rise over the years, to the surnames of Boxworth and Boxford, still common in parts of the country known throughout the wizarding community to be centres of wandbox making excellence. 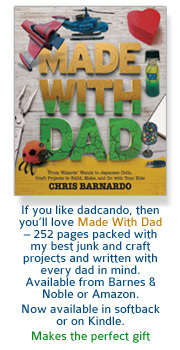 It is a trade that can be heartily recommended, even to those not bought up amongst the deep, dark rich materials of enchanted board, fabric and assorted agglutinants or the well worn boxmaker's tools of point, perch and plate. 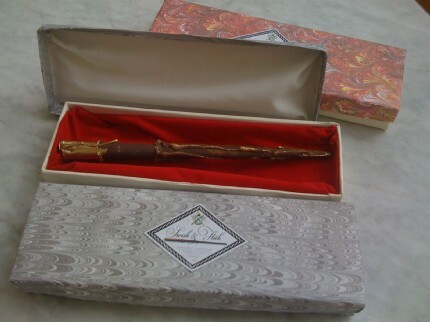 All students of wandbox making must serve an apprenticeship that begins the day they make their first elementary wand box. 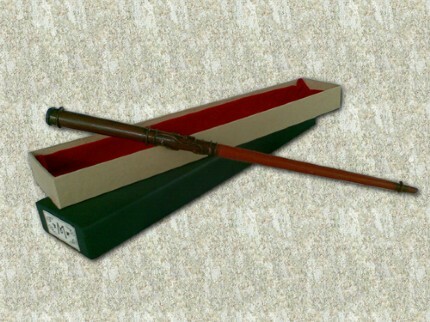 If you have made a wand (and we have a fabulous project for doing exactly that, here) and would like to present it and keep it safe when it is not in use then this project will be perfect for you and your first step towards becoming a master wandbox maker.
. . . The first stage of wandbox making is gathering the dimensions and calculating the box size for the best fit. Experienced wandbox makers can do this in their heads, but by convention they always complete a wandbox specification form. Traditionally this is calculated magically. 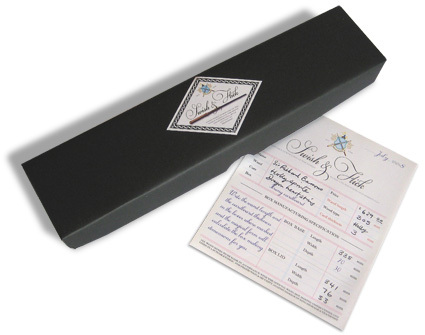 The wandbox maker fills in the known dimensions of wand length and box card thickness and then the form does the rest, but as an apprentice you will be required to do this manually. 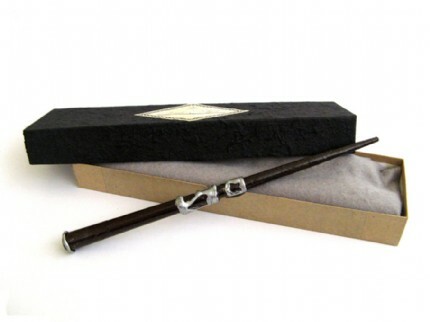 Swish and Flick, purveyours of the finest wands and wizarding paraphenalia have kindly provided their standard box specification form (that's the one you can see here) as a downloadable printable (see below). 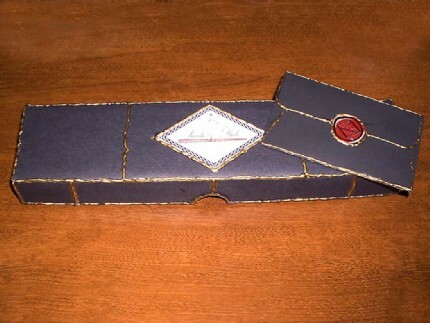 The wandbox is typically made from enchanted cardboard of between 2mm to 5mm in thickness. 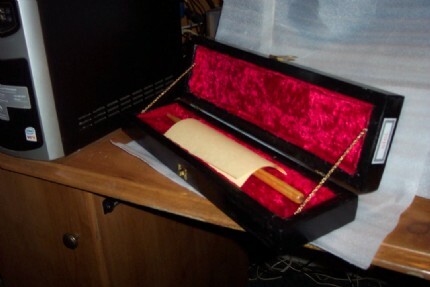 Tradition requires that the box is covered with a thin, but good quality paper (or for exceptionally expensive wands, silk fabric), and that the base and lid of the wandbox be covered in contrasting colours. 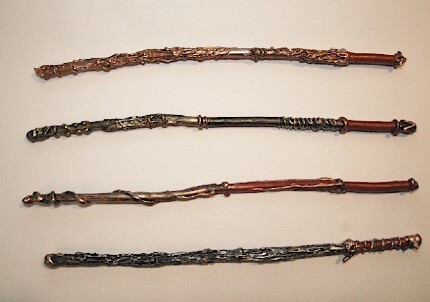 In the example shown here, Swish and Flick have used their preferred combination of silver and black, although of course, as the wandbox maker, you may use your taste and judgment to choose any suitable colours. Specialty papers exist for covering board, but any thin paper will do, even gift wrapping paper has been known to be used when the occasion demanded it. All you need to do is download the Box Specification Form (cut it out) and together with the instructions downloadable you will have all the information you need, to fill in the form and begin making the most fabulous wandbox. 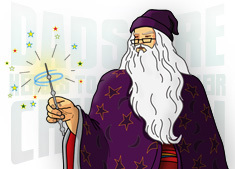 You see that Swish and Flick have even provided one of their labels which we supply here as part of the download so that you can really finish off your wandbox in the most professional way.
. . . Your full, easy to follow wandbox instructions are available in both A4 and US Letter format PDFs and can be easily downloaded by just clicking on size you want. Posted by nepenthe - It took me awhile to do the maths, but was happy with the results! 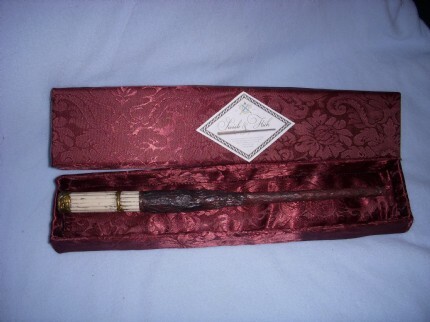 I lined the box with gray felt, which I padded underneath with several layers of quilt liner that I was able to make a depression in for the wand to be nestled in. 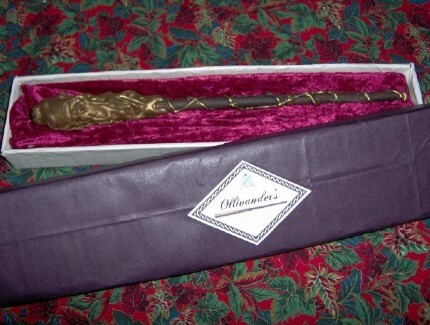 Posted by jacjan - We made an Ollivander's label for our boxes. Posted by yoyomax12 - After you get over your math anxiety for calculating the dimensions, this box turned out perfectly! 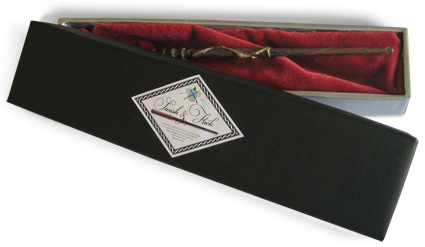 Posted by spoffk - I made the box so it looked like it was from Ollivander's wand shop (I used Photoshop on the labels). 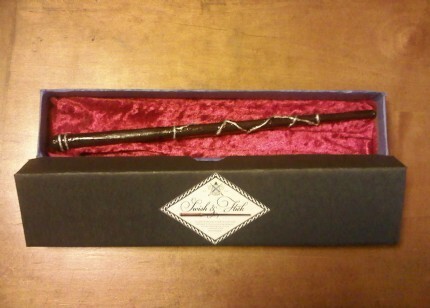 For the wand I used the wand pattern on this site. 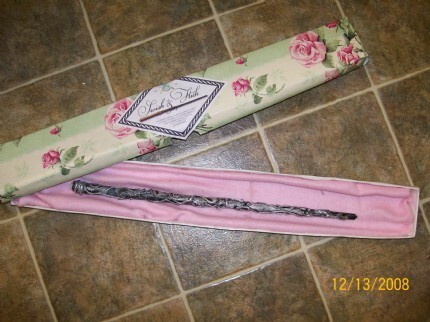 Posted by potatojesus - A wand box with matching envelope. Posted by albuehler - The instructions called for use of cardboard. I had many scraps of 1" X 2" and 1"x4" lumber laying around from my model railroad table. I decided to put them to use and build a slightly sturdier box. The chain is an old necklace.The hinges and hasp are from an old jewlery box. The fabric is a scrap I picked up at a local fabric shop for 50 cents (USD). 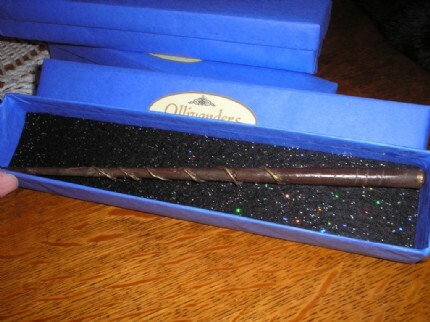 The wand is a carved and whittled down dowl that was laying around. 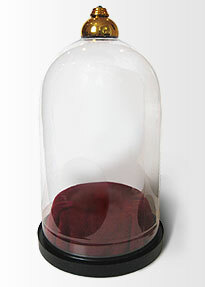 Thanks for the great ideas on what these things look like ! 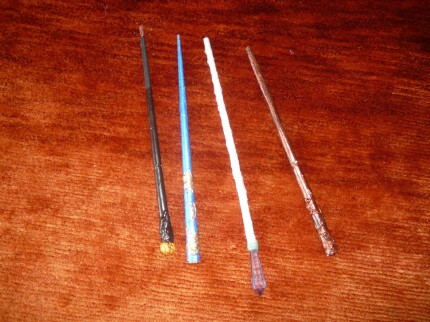 Sorry; Harrry Potter isn't one of my strong points of knowledge. Posted by jolovesvlad - This came out great! The only thing I did differently was to make the inside padded. 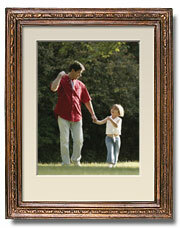 It will be a worthy part of the Christmas gift. Thanks for project! 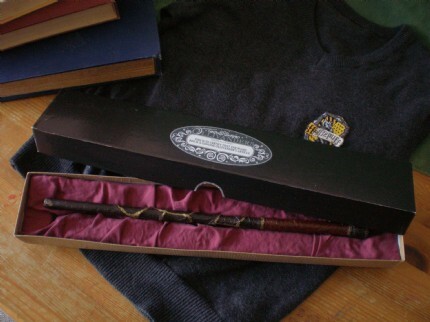 Posted by mimbulus - This is my wand box, including the wand of course. I've create my own logo for the box..